Newborn babies frequently have issues like gaseous stomach and constipation and these mostly affect formula-fed babies although it can also affect breastfed babies if they are allergic to a certain ingredient in their mom’s food. However, there are some formula foods that go gentle on babies’ tummy and so are great for babies with a sensitive tummy. There are feeds that are specially formulated for babies suffering from gas or constipation, for example. If you are not well informed or just a first-time mum, you may be having some difficult times choosing the best formula for your baby with a sensitive tummy. That is why we have done the research and come up with five best formulas for babies with sensitive tummy to make it handy for you and save you and your baby lots of stress. The main reason why most baby experience constipation is because their digestive system is not yet properly developed and introducing them to formula food instead of breast milk regularly make them constipated. One thing you need to know about the best formula for babies with sensitive tummies is what work for your neighbor’s baby may not particularly work for you because different babies suffer from different digestive issues. Some babies may be allergic to specific substances in a specific formula which can make them constipated. It is, therefore, essential to discover the actual problem your baby is having whether constipation, gassing or other issues to enable you to figure out the best solution to the issue. 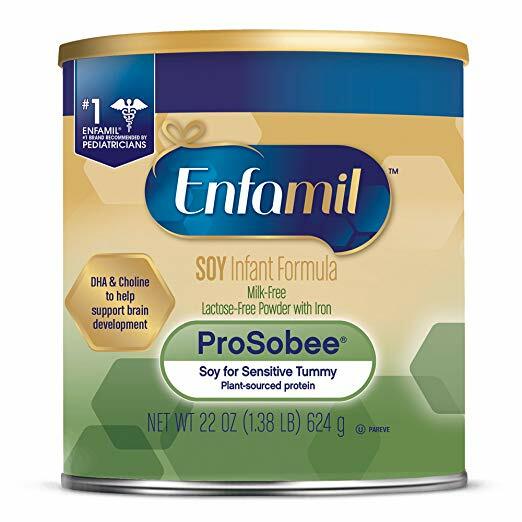 Enfamil Prosobee is a soy-based infant formula that doesn’t contain any cow’s milk or lactose. Babies who suffer from gaseous stomach because their bodies won’t digest cow’s milk commonly find it beneficial to switch to a soy-based formula like Enfamil Prosobee. Prosobee has been found to help to reduce gaseous stomach in some babies although it may not be the best suitable option for all babies depending on the condition and body composition. It is suitable for babies who are under the first 12 months of age. Enfamil is a popular brand commonly recommended by pediatricians. It comes with an equivalent degree of brain-nourishing DHA levels as Enfamil routine formula to boost cognitive brain development of your child. 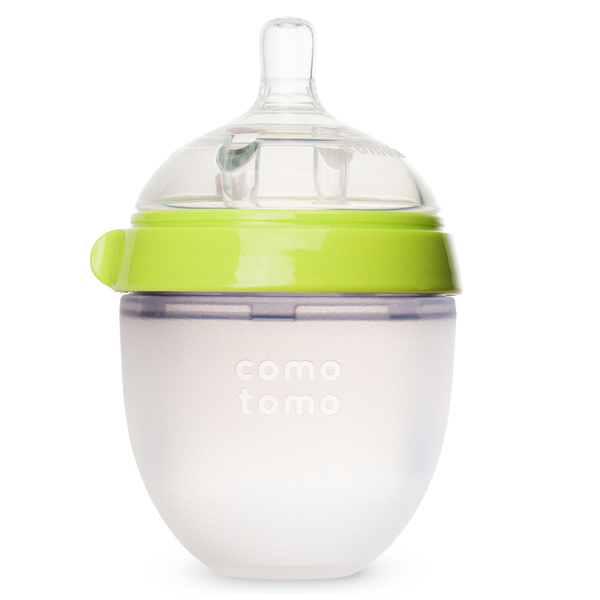 It is ideal for babies with lactose intolerance or who sensitive to other ingredients from milk-based formulas. For the period of 12 months, this formula for sensitive tummy is designed to meet the whole nutritional needs of the infant child. It contains special nutrients which support cognitive development like DHA and choline. Enfamil ProSobee also comes with a special blend of vitamins structured to boost a healthy immune system. The baby formula is also great for families who have special dietary needs like vegetarian or Kosher. With this feed, your baby would no more make a fuss associated with insensitivity to milk-based formulas. 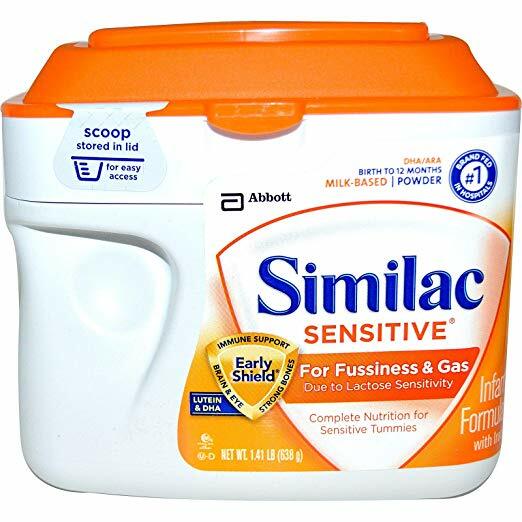 Similac Sensitive is a special infant formula designed for babies who have with sensitive tummies and issues like colic, bloating, gaseous stomach and constipation. 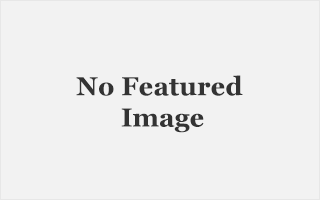 This baby formula is related to the Enfamil Gentlease baby formula. It contains cow’s milk but it contains specific carbohydrate type which can minimize gas in babies. It is great for babies who are sensitive to lactose and who are experiencing gaseous stomach. It comes with a blend of nutrients which includes OptiGRO, the company’s DHA blend, Lutein and Vitamin E, which are special nutrients in breast milk that supports baby’s normal brain and eye development. Similac is a top trusted milk brand among moms and they are commonly used for babies in the hospital. If used as instructed one 34.9 formula can generate roughly 43 six fluid ounce bottles. Similac Sensitive Infant Formula is easy on babies’ tummy and is not hard to digest. It is designed with complete nutrient required by your child to maintain a healthy growth within the first 12 months of his or her life. It is blended to support t overall baby’s overall growth including ensuring proper brain, eye, and immune system development. It is not suitable for babies suffering from galactosemia. Enfamil PREMIUM Non-GMO Gentlease Infant Formula is the foremost formula that comes with the same amount of the two essential brain-nourishing formulas in breast milk- inositol and DHA. It has medically shown to help reduce fussiness of babies with formula food. It as well mitigates the occurrence of gaseous stomach and helps to keep babies calmer and quieter. It comes with easily digestible proteins. It is blended with 30 different nutrients to support optimal health of the babies and comes with 2 times the additional amount of Omega-3 DHA compared to related brands of infant formulas. DHA is an essential fatty acid that fosters the learning ability of the child from birth till when the baby is 5 years. It also contains a blend of minerals and vitamins that support optimal health of the immune system that helps your baby to maintain a healthy growth. 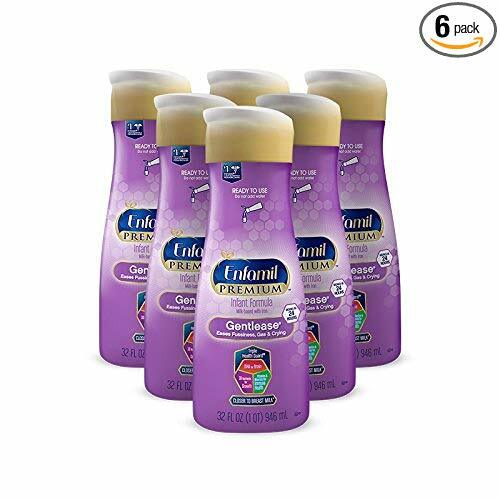 Enfamil Premium Gentlease Infant Formula comes with a user-ready and easy to pour bottle, which makes your baby food always handy anytime you want to provide them with the required nourishment both in the day and the night. 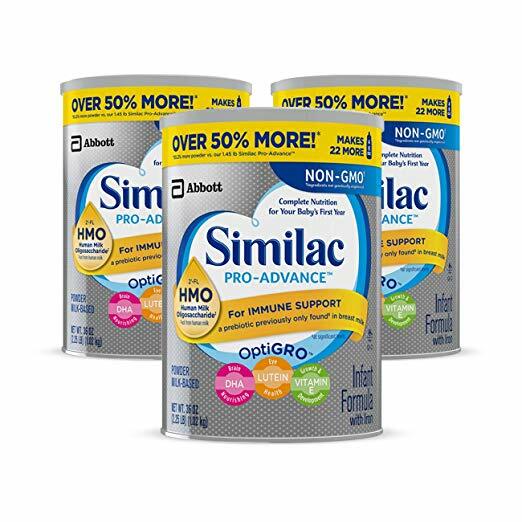 Similac Sensitive Infant Formula is an easily digestible milk-based formula structured to meet the needs of your babies with sensitive tummies. It is blended with ingredients that ensure it is nutritionally complete and contains the right amount of nutrient that your baby needs for healthy growth. It is also fortified with iron to ensure that your baby has an adequate supply of iron for a healthy growth. The infant formula is designed to help you tackle the problem of babies with fussy stomach and who throws up their flood. If your child is also experiencing a gaseous stomach, this baby formula is a great solution to the problem. It comes with nutrients like OptiGRO, the company’s special blend of DHA, Lutein, and Vitamin to assist the baby’s general growth, the brain, eye and the development of their immune system. However, this infant formula is not suitable for babies suffering from galactosemia. It is a great option of baby formula if your baby throws up and poops continually. It also has the greatest taste and doesn’t come with any form of unwanted side effects. The liquid bottles will be great when you are on the go but you may want to consider the bottle for use in the house. However, the only issue with this is that it comes with a smaller tub and still cost as much as the right sized tub. However, it is still a great buy as it offers great value for the price. All the ingredients in this baby formula are cautiously chosen to meet a high-quality standard. They are Non-GMO and not genetically engineered. It is suitable for babies that are sensitive to lactose. However, it is not suitable for infants or children suffering from galactosemia. It contains your baby’s complete nutrition for the first 12 months of the baby’s life. Similac Pro-Sensitive assists in the development and a boost of your baby’s immune system due to the presence of 2′-FL. This ingredient functions by bringing many gaps that exist in the immune function of babies fed with formula-fed and breastfed babies. 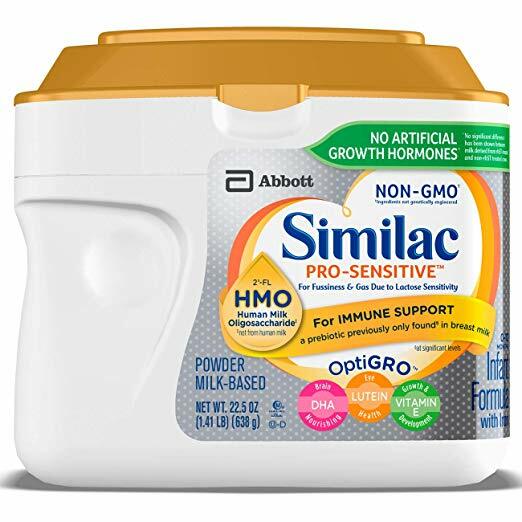 This 2′-FL HMO prebiotic in Similac easily circulates to all parts of the body, unlike other formula brands. With the baby formula, your baby’s fussy eating, gaseous tummy and throwing up food is put under a complete control, giving you and your child peace of mind. It contains vitamin E an essential, nutrient in the breast milk which is beneficial to the cell development. It also contains other nutrient blends like DHA, Lutein which are found in breast milk. The role of the DHA is to improve the development of the brain while Lutein assists in the normal growth and development of your baby eye function. 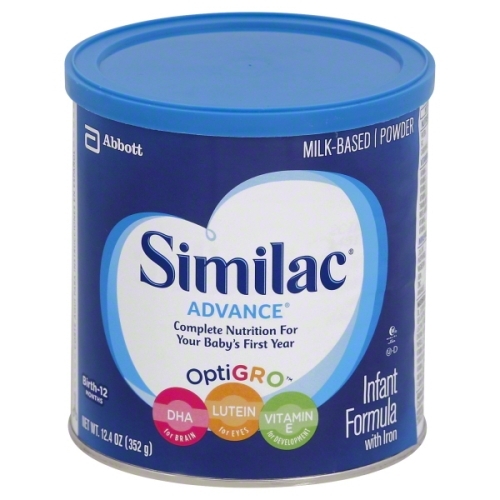 Similac is a top infant formula brand recommended by moms and used in hospitals.